We are letting a sweet self-contained apartment which is part of a charming brick-built family house on the outskirts of Bardolino on Lake Garda, in the lower half of the 'Riviera of Olive Groves', where the lake is at its widest and the Mediterranean vegetation bountiful. Hills and vines always make pretty scenery, but there is none prettier than those of Bardolino, facing the lake and the sunset, a serene pattern of vineyards, olive trees, cypresses, castles and Veronese villas in pale pink stone, set on gentle slopes, lit up by the shimmer of lake-reflected light. It deserves to be called charming, and produces a wine to match. The apartment is generously furnished and equipped, having previously been used by members of our family. It has a large terrace wth a view of the lake. The Area: The location of the apartment is ideal for touring the Veneto and Trentino-Alto Adige regions, and for visiting many of the great cities of north Italy: Verona (half an hour's driving time), Vicenza, Mantova, Trento, Bergamo (1 hour), Venice and Milan (2 hours) and Bologna (2.5 hours). There are wonderful walks, from strolls along the lake shore to Lazise, Bardolino and Garda, to hikes in the surrounding hills and climbs in the mountains (perhaps with the help of a cable-car). You can hire bikes and scooters, pedalos and motor-boats. Entertainment: Take a steamer to visit some of the other little towns on the lake, including the famous Sirmione, or spend a day at a theme park such as Gardaland, Caneva World of Water or Safari Zoo, all just a few miles away. Historic gardens, castles, vineyards, cafe's and restaurants to suit every budget - what's missing here? Only noisy traffic: no-one but residents drive on the road that leads to the property. Before you leave this page:: A thorough clean of the apartment between visitors is included in the price. Arrangements and instructions are all handled in England - see 'Contact'. Accessible airports are Verona, Milan Bergamo, Milan Linate, Milan Malpensa, Venice, (in order of closeness). There are public transport connections or we can arrange for a local taxi to meet flights. For one-bedroom and studio apartments in a lovely condominium in Garda, the next little town to Bardolino, see also property number 1956. Parking is just inside the garden gate. The swimmimg-pool is shared among 30 neighbouring homes. The owners, an English-speaking Italian couple, live downstairs. They are very hospitable and take good care of their guests. It takes less than 10 minutes to walk down to the lakeside or bus stop, and the beautiful walk along the lake to the town centre takes another 10 - 15. There are two adult bikes on offer for the use of guests. We had a fantastic week staying in this lovely home. We would definitely go back. Bardolino. We highly recommend this property to anyone wanting a quiet peaceful holiday but close by to sights. We had a fantastic week here. Gerry and Maria were brilliant hosts making the stay really easy for us. They greeted us well, had a few treats in the fridge for us and even cooked us some pasta as we arrived late! The location was very good, just a few minutes from the edge of the lake and then a beautiful stroll along to the town for another 15 minuets. The apartment was well equipped and comfortable. Our two year old had a lovely time and it was a great area to have a toddler. We would thoroughly recommend staying here. My wife and I try to make the arrival of our guests as welcoming as possible by having some essential items like mineral water, beer, wine, milk and seasonal fruit at their disposal in the fridge. If the guests arrive then at dinner time, my wife prepares for them a plate of pasta or rice. Guests always shows to like these small welcome gestures and we are happy to do it. I can't recommend this place enough if you want a peacefull vacation, the apartment is equipped with everything you need and the owners are adorable. A healthy 10-15 minutes walk brings you into the commercial center of Bardolino near the port and you find everything there, from all kind of restaurants to minishops... me and my wife stood 9 days and we loved it. It is so wonderful to hear how much Francisc and his sweet wife enjoyed their staying in our apartment which is indeed a comfortable , spacious suite where one can relax enjoying in the evening from the terrace spectacular sunsets over Lake Garda. We do value guests like Francisc and his wife who take care of our apartment as if it was their own home. Marvelous guests! Both my wife and I try our best to make sure our guests fully enjoy their vacation. We wish Francisc and his wife good health an great fortune. Heerlijke vakantie gehad. Gerry en zijn vrouw zijn zeer lieve behulpzame gastvrije hosts. Prachtig uitzicht op het gardameer vanaf het ruime balkon. Bardolino binnen enkele minuten te bereiken op de fietsen die beschikbaar voor de gasten zijn. Ook garda en lazise binnen korte fietsafstand Wij komen zeker terug ! Gerry and Maria really are wonderful hosts! They made our stay in Bardolino really special by going out of their way to help us. They were great with our little boy who took a real shine to them! Apartment is really nice, clean, spacious and well equipped. I would definitely recommend this apartment! A perfect place to stay when you love a quiet place in the Lake Garda region. Altough the owner lives on the second floor he respected our privacy. With shops and the lake nearby and a swimmingpool on walkingdistance it was a very nice place to be. 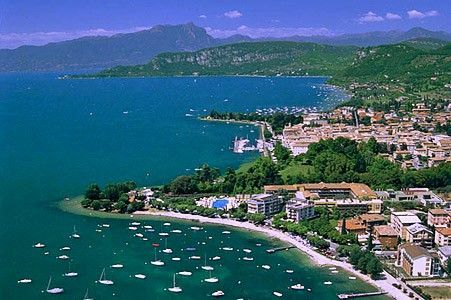 Bardolino is on the south-east shore of the lake, at its widest point, located in a sheltered bay. The house is 7 minutes' walk from the lakeside, a further 10-15 from the town centre. On making a firm booking, you will be given the bank details of the Italian owners of this property, to which 25 per cent should be transferred in euros to secure the booking. Your host then sends you a contract. The balance is paid in cash within a day or two of your arrival. Queries can always be addressed either to your hosts, who speak good English, or to me, the British contact and friend of the hosts, contact details at the top.